Every time I pull the ‘Trident’ out of my bag, people stand back in awe. Some folks gasp, some folks cry, and some just throw money in my general direction. …of course this is all true too. The Trident is a very over-stable fairway driver. It looks like Latitude 64 took a basic driver, and just cut the pointy edge off of the wing- making it super durable and stunted. I don’t know how they came up with the design- and I’m guessing they didn’t take an existing driver and just “cut it.” However, it does behave like a fairway driver in most ways- and remembering this helped me throw it in the right situations. Personally, I don’t like the way a Hornet, Wasp, or even a KC Pro Roc feels in my hand. They’re all great discs to great players, but I can never get a clean release in the way I can with a fairway driver, or even a Buzzz. With this in mind, the Trident has a nice thick wing which fits in the hand well and can naturally take a firm, confident grip- and consistently gives me a clean release (yikes, don’t dissect THAT phrase!). It also flies more like a driver than a midrange- even if I use it in some shorter situations. 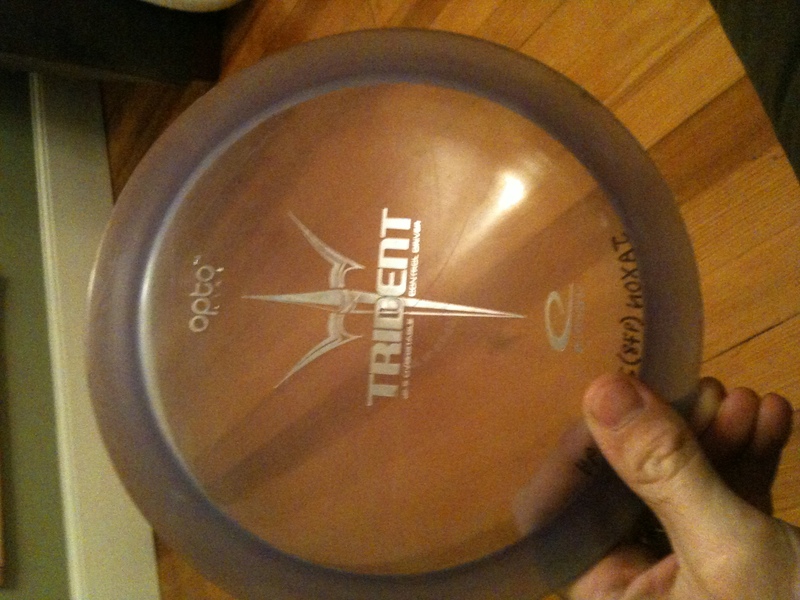 If you throw it on a level surface, you may not see the difference between the Trident and an overstable midrange disc. Both discs will travel a similar distance with a similar flight path. I finally noticed the difference on a hole with a drop-off hill about 260+ feet out. When throwing a midrange, even if I threw it out past the edge, it wouldn’t travel too far down and into the woods. However, the Trident being a fairway driver, has more speed, and even with the steep fade angle, it traveled much farther when it got to that point- resulting in an overthrow on most attempts. The speed brought it out farther, and carried it down further. In any case, it’s very reliable once you get to know it. The Trident found a home in my bag with it’s over-stability. You’ll notice (if of course you look) that on the Marshall Street flight guide- the Trident isn’t ALL THE WAY over to the left with the crazy discs. 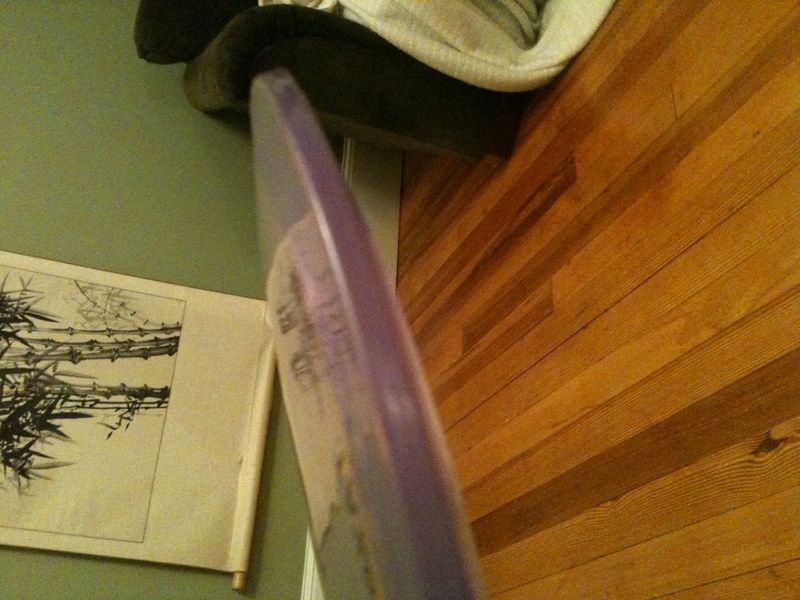 It is a useable disc- yet it will always come back to the left for a right-hander. I break it out when it’s INSANE windy- and when there’s a hyzer that I HAVE to hit. I throw it sidearm, over-hand, as well as backhand. One last tid-bit- for those not familiar with the Opto line of plastic, by Latitude 64, it’s a tasty ‘champion’-ish blend with plenty of gummy feel, but also an extreme amount of durability. This entry was posted in Equipment and Gear and tagged 64, disc, golf, lat, latitude, review, trident. Bookmark the permalink.